How Can I Teach My Aussie To Be ON Or OFF Guard When At Home? I have a question on training my Australian Shepherd in a specific situation: how can I teach my Aussie to be ON or OFF guard when at home? 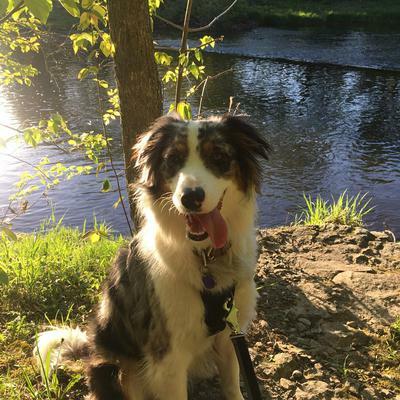 Gatsby is a sweet Australian Shepherd (1yr), he is very loyal and protective of us. We had some issues with him being over protective and reactive on leash when he turned about 8 months old; he would lunge and bark at people crossing us on the street. We have taken all classes available with him and we managed to fix this problem, he now looks at me when he is unsure of something on our walks. The problem is that he is now being protective of our home; when we have people over; off-leash he is over excited and jumps on them. On his long leash he will bark and lunge and even bite strangers (especially men). I am now ashamed to let him outside when we have people over because I do not know how to control this behavior. I don't mind him being a bit protective or letting me know if someone is there since I work from home alone in the country. BUT I want to be able to let him know that a person or situation is OK and he can back off. I have no clue how to approach this training and he is such a loving sweet dog, I would love to be able to take him outside and let him meet people. I hope you will be able to give me some advice. Comments for How Can I Teach My Aussie To Be ON Or OFF Guard When At Home? What type of exercise regime is he or she on? He is pretty active, I work from home and we live in the country so he gets to run around a lot, we go for walks too but it doesn't seem to be enough for him. What works best is the dog park which gets him exhausted. But I've noticed that even when he is exhausted and sleeping he will get up and start reacting when someone is entering the yard. Sometimes dogs feel trapped on leashes and can get fearful because they cannot escape when is a situation. My dads dog will get very fearful and bark when passing other dogs on a leash but w/o a leash, he cares less about them. As for having people over with the barking problem, I would suggest doing the same thing with your dog that you do outside and have him look at you when he’s unsure. So when you have company over, have him focus on you and when he does reward him. Over time the behavior will improve and you can work on both problems together.